This review has not yet been approved by the owner of this writing service. If you are the webmaster of Zessay.com, please Contact Us to approve or remove this review. Usability of this company’s website is quite limited – it doesn’t contain much more than a price list and a link to the order form. Some information can be fished out of the user agreement, but it lacks answers to many questions. A proper FAQ would be of much help. The price depends on a number of factors, namely: deadline, academic level, type of work (academic writing, editing or business writing). In general, prices are not among the highest in the industry – academic writing costs from $17.55 to $45.85 per page, and it should be noted that in terms of this service a page is 300 words rather than the usual 275 words. Support is available via chat, phone and email. Whichever way you use, operators seem to be rather sluggish – either they have to deal with many clients at a time or don’t have a very clear understanding of what they do. Customer support is obviously outsourced, so there is nothing new about it. There are no writing samples on the website, but the quality of content on the site per se suggests that it is nothing to write home about. Quality ranges from more or less satisfactory to quite poor; and a website that can’t even provide proper texts for its own few pages is hard to take seriously. Free revisions for 10 days after you receive your paper. 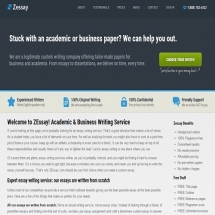 ZEssay.com is a very average writing service in all respects. Forgettable design, an unhelpful website, an intrusive registration process, slow customer support – you get used to all these things, but it doesn’t make them any more justifiable. The only thing that is in any way attractive about it is its pricing policy, which is lower than industry average. One should remember, however, that academic writing isn’t an area where affordability often goes hand in hand with quality. As the rest of the service doesn’t imply high quality, it is doubtful that they manage to get professional writers among their employees.